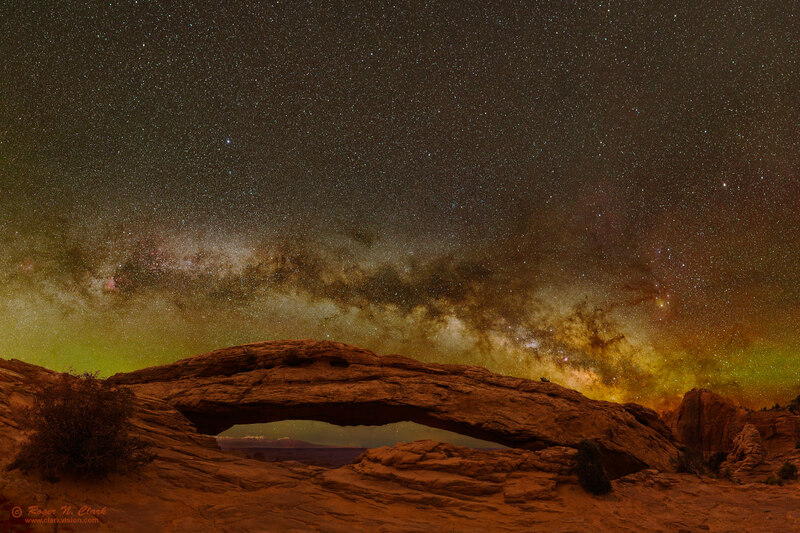 On an early May morning, the Milky Way rises over Mesa Arch in Canyonlands National Park, Utah, making a stunning nightscape. The center of the Milky Way and the constellation of Sagittarius are on the right side of the arch, and the Constellation Cygnus is above the left side of the arch, with the red North America Nebula. This scene is all natural light: the light of the night sky includes stars and nebulae shining on the landscape. Other light is red and green banded airglow, most prevalent near the horizon on each side of the arch. The red+green airglow imparts a warm yellowish light on the landscape. No artificial lights were used to illuminate the arch. For more on natural color in the night sky see Parts 2a, 2b, 2c and 2d on Color of the Night Sky and proper post processing to show those colors. Technical. Canon 6D 20-megapixel digital camera, Sigma 35 mm f/1.4 DG HSM lens at f/1.4. Forty two exposures at ISO 1600 and 6400 were made for the mosaic. On the sky, the camera tracked the stars using an Astrotrac, with 29 exposures, 30 seconds each, ISO 1600, then 13 images with 60 second exposures of the land were made with no tracking, with ISO 6400 and 1600. The land includes multiple focus points to allow focus stacking for improved depth of field, making a sharp foreground as well as sharp sky. Final image is 13,196 pixels wide by 9,813 pixels tall covering an angular area of about 138 x 103 degrees. The image here is a crop off the top to give a 1.5:1 aspect ratio. Note, there is no change in sensitivity with ISO, so the ISO 1600 exposures had the same light and noise levels because the exposure time was the same. The signal levels on the land exposures were equalized in the raw converter. ISO 6400 is the ISO I use for live view manual focusing, but I did some exposures on the land after focusing. This sped up the the varying focus positions on the land.